Can we talk about the fact that this collection boasts SIX topcoats, FIVE of which are glitter toppers? That alone made me stop in my tracks when I first read about it online. Glitter toppers are easily my favorite kind of polish, not just because of the sparkle factor, but also because of the transformation value. Glitter toppers give new life to old polish in so, so many different ways! Blue Hue is described as a "blue glitter hint." It's a sheer, buildable blue with opalescent glitter that flashes orange, gold, green, blue, and purple. There's a decent amount of glitter sprinkled in Blue Hue. Great glitter payoff, and the formula wasn't overly thick or glumpy! Purple Haze is the violet sibling to Blue Hue, with just a smidge more glitter packed in each coat. It's got the same opalescent glitter, but in a sheer, buildable purple base. The blue and purple flashes tend to be the most obvious in this polish, and it makes for a shimmery fairy-sprinkles kind of effect. Rosy Glow rounds out the trio of opalescent glitter toppers. It's a "pink glitter hint," and although the glitter looks more sparse in 1 coat in my photos, Rosy Glow still built up just as well as Blue Hue and Purple Haze. The opalescent glitter in Rosy Glow flashes from orange to purple and all the colors in between. left to right: 1, 2, 3, and 4 coats of What's the Spatter? What's the Splatter is "clear with white and black hex glitter," but there's also a superfine irridescent glitter in the mix, too! It didn't come through in my photos, but it's there in person, I promise! There's a lot of other black and white glitter polishes on the market, but the irridescent sparkle definitely makes this one unique! What's the Splatter also has a very nice glitter to polish ratio, making it really easy to apply. No fishing required! Frost Finish is a matte finish top coat from Pure Ice. I'm not a huge fan of a matte finish, but Frost Finish does a good job. I like the look of all of the New Year New Hue polishes matted, including Dollface, but not so much with Flawless. It almost completely erases the metallic finish, which is totally the point, I know, but I don't like it as much mattefied. Now, In addition to all that glittery goodness and the matte top coat, the New Year New Hue collection contains two other polishes, a creme called Dollface and a metallic named Flawless. Dollface is a "soft creme peach" polish. Given the fact that this is a pastel, and pastels tend to love streaking, I was pleasantly surprised with the formula. It smoothed out nicely. While I'm not the biggest fan of this color on my nails exclusively, I can see myself reaching for this to create festival nails come Spring/Summer. I'm already itching to pair this with mint in a negative space manicure! Flawless... "a frosted light gold with a metallic finish." This color surprised me a little, not gonna lie. I didn't expect it to be so sheer, and I didn't think I'd like the pearlescence in it as much as I did. Flawless builds nicely, and it's a really workable tone of gold. I like that it's not overly yellow. I see this polish much in the same vein as Dollface... I can see it being an excellent stamping polish, and I'm so curious to see how it looks when it's sponged on! Overall, I really like this collection. Pure Ice mixed it up a lot, and you don't often see collections like this. There's a lot of new finishes and effects to try here. If I had to pick favorites though, I would definitely say Poppin' Bottles and What's the Splatter, then the trio of Blue Hue, Purple Haze, and Rosy Glow. 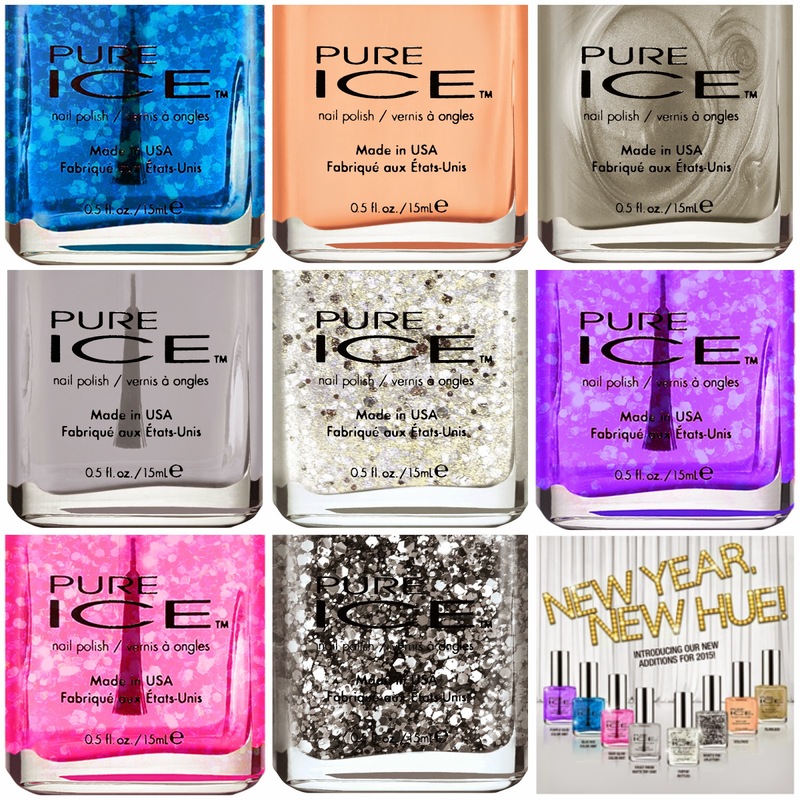 I like how Pure Ice added a little sparkle into these sheer, buildable shades! Oh, and remember how I said there are lots of ways to transform polish with these glitter toppers? I've got a couple posts coming that will demonstrate just that, and go into a little more detail!